If you send and receive a lot of e-mail on your iPhone, there may be communications with Very Important Persons that you don’t want to get lost in the electronic slush pile. Mail lets you identify people and companies to a VIP list so any incoming and outgoing messages exchanged with those VIPs go to a special VIP mailbox. Tap a message that you sent to or received from the person or business you want to give VIP status to. Tap the name in the To or From address field. The screen that opens gives you at least three options: Add to VIP, Create New Contact, Add to Existing Contact. If the person is in your Contacts, the related info screen appears with the various Contacts options. Tap Message in the upper left corner to return to the originating message. Tap the back button in the upper left corner or swipe right several times to return to the Mailboxes screen. Tap the Info button to the right of the VIP inbox. A list of your VIPs appears. If you eventually want to delete a VIP, tap Edit and then tap the red and white minus sign followed by the Delete button, or swipe the person and tap Delete. Tap Done when you finish demoting VIPs. 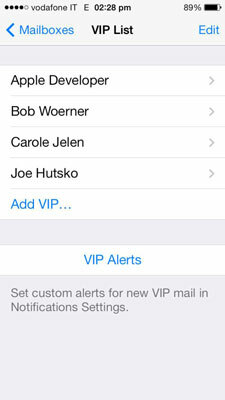 Tap VIP Alerts to set the alert style, sound, and notification you wish to receive when a VIP sends a message to you. Double-tap the Home button and then tap Mail to return to the Mail app. To add VIPs directly from Contacts, tap Add VIP on the VIP List screen. Contacts opens and those with e-mail addresses are bold in the list. Tap the name you want to add.